Taking a staycation can be a unique way to try a restaurant that you wouldn’t ordinarily visit. While on a staycation, consider changing your eating habits and wander outside of your hood. Why not take the opportunity to mimic something that you would experience in another country? Kendall’s Brasserie is the ideal place to have a transportive experience to France without spending the money for travel. As in true brasserie form, the bar is the center of the restaurant; the French antiques that adorned the walls made me forget that I was only miles away from home. From now until the end of May, Kendall’s Brasserie is featuring “Spring in Provence”. This special event is part of their “Passport to France” series where executive Chef Jean-Pierre Bos takes guests through a virtual culinary tour through France. Recently, I was able to preview some of the items that will be served. Housemade albacore tuna confit is the centerpiece of their Niçoise salad. 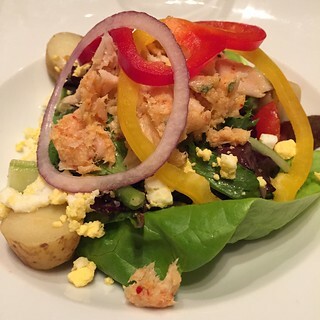 They add Boston lettuce, haricot vert, tomatoes, potatoes, chopped eggs, niçoise olives and toss the ingredients with a shallot vinaigrette. The fresh albacore confit made me realize how tasty tuna can be. Farmers market quality ingredients allowed the salad to shine. 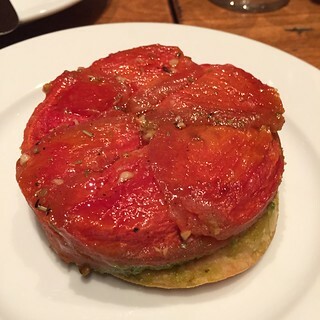 Tomato tarte tatin consisted of tomato confit, basil and parmesan. Most tarte tatin crusts are similar to a pie or a quiche in appearance. Their version was unique because the bottom of the crust was very thin and super crisp. Tomato lovers will enjoy this dish. 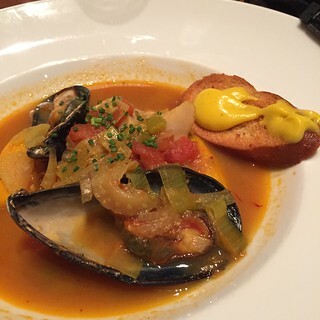 The bouillabaisse consisted of rock snapper, shrimp, sea scallops, saffron potatoes and mussels in a Provençal broth. A rouille sauce with crostini was provided on the side to add to the soup. The fish was flakey, very moist and the broth was absolutely delicious. Chef Bosc disclosed that the secret to his broth was adding a splash of pernod. This gave the broth a slight flavor of anise. 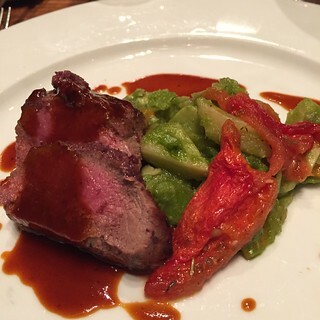 The lamb loin was roasted to perfection and served with a savory brown sauce drizzled over it. Another traditional Provençal dish, artichokes barigoule with sliced fava beans was served with the lamb.The artichokes were sliced in small sections and were extremely tender. The Nougat Glace Maxim consisted of candied fruit & nuts, frozen meringue and raspberry coulis. I really enjoyed this dessert; it was both fluffy and crunchy. This was the first time I actually enjoyed eating nougat. 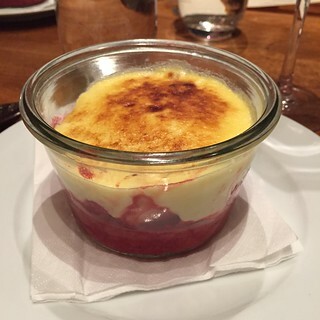 The other dessert option was a strawberry and raspberry frozen dessert named strawberry chaud and froid. The top was a lemon mousse that had the consistency of a brulee. The bottom was a combination of raspberry sorbet and strawberry chaud. This three course pre-fixe meal is only $40, which in my opinion, is a very good deal. The best part about going to Kendall’s Brasserie is that you get to experience French food in the original French tradition without having to take an 11 hour plane ride to Europe! PS. If you enter between 8 and 9:30pm, you will get complimentary parking! What a huge perk for downtown LA. As a reminder, the Spring in Provence menu ends at the end of May.